Mac OS provided some fabulous features which are not available in other operating systems such as Windows, Linux. One of the coolest features is that you can take the help of the inbuilt Contacts App if you wish to call or text someone directly from your Mac. I have seen most of the guys using Mac Pc/laptop don’t know how they have to use the Contacts App. So, I thought why not should I tell you guys that how you set up the Contact App as well as how to add contacts on MacOS. Though, here is the complete article. Also, if you have the Mojave version of Mac OS then you can read this article to use dark mode in macOS Mojave. The Contacts app can be used without the iCloud service. But, if you are using a MacBook and do not use the iCloud to sync everything for you so that you can take a backup of everything, then it not worthy for you. Actually, we need to login or connect to our Apple device with the iCloud using the Apple ID. That makes the thing easier while using the Apple device. The contacts will be synced, used later, used on other devices too, and more. So, it is better for you that you must connect the Contacts App to your iCloud account. On your Mac, open the Contacts app from the dock. Now, from the menu bar click on the Preferences. Then, click on the Accounts tab. After that, click on the + (plus) button. From the list of the available services, select iCloud and click Continue button. Note: You can choose any of the services according to you. Lastly, enter the credentials of your Apple account and click on Sign In button. That’s it. Now, you are able to add contacts to the Contacts app. Once you are done settings up the Contacts app on your Mac then you are ready to go for the next step. Definitely, in this section, I am gonna show you how to add contacts on MacOS. However, if you have connected your Contacts App with the iCloud account then you can add or create a new contact using any of the Apple devices. But, here we have to learn how to add contacts on MacOS that is why the method is gonna be depending on the Mac, not on other Apple device. So, let’s get started. Open the Contacts app from the dock, on your Mac. Now, click on the + (plus) button at the bottom of the page. Then, click on New Contact option. After that, fill all the details regarding your new contact. Lastly, click on the Done button to save it. This was all about how you have to set up the Contacts App using your Apple ID. 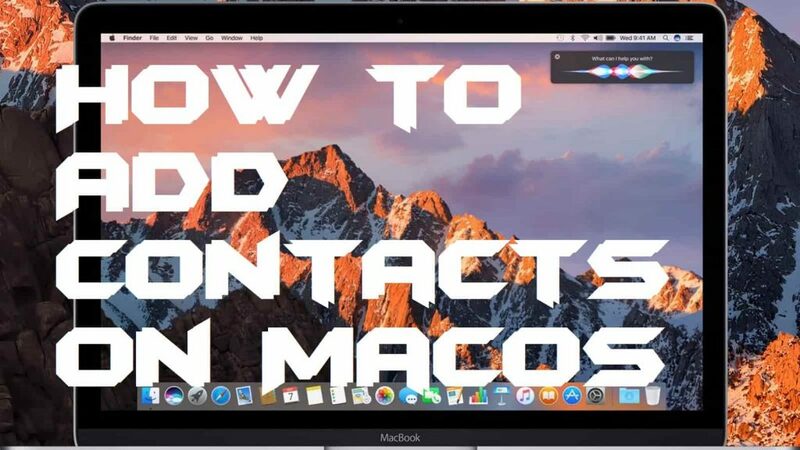 We have also seen how to add contacts on MacOS in a very simple way. This is a genuine and authentic way to do so. You dot have to take the help of third-party apps to do so. You can explore the Contacts App to discover more options regarding the contacts. I have also posted an article about how you can connect AirPods to MacBook Pro & Air, make sure you check it out. I hope this article has helped you a lot in learning the same. You can share this with your friends or family members so that they can also learn how to add contacts on MacOS.